The local side Girona have been without doubt, one of the sensations in this years Spanish league after achieving promotion last season. Recently becoming part of the City Football Group, they have benefited from the loans of several promising youngsters like Maffeo, Marlos Moreno, Douglas and Aleix. Under Pablo Machin they have achieved a notable record that has allowed them to still be looking to the European places as far in the season as February. From the other side, Leganes is already in their second season in the highest level of Spanish football and becoming a noteworthy team in the League. The small team from the south of Madrid – who, only four years ago, were playing in the third division of Spanish football – have managed very efficiently the resources available both at the Club organisational level and at the sporting level. Under a well-established coach (he was already the coach back in 2014 in the 2B division) they have built a phenomenal team on the basis of a solid defensive organisation. They are also keen on developing young prospects from their Academy with two players from the second team in the squad for this game: Jaume Sierra and Alex Mozo. All of this shows how well this club is working in order to keep their spot among the best teams in the Country even sharing their geographical location with giants like Real Madrid, Atletico and some others like Getafe or Rayo Vallecano. Even more remarkable was their historical win in the Spanish Cup, eliminating the UCL winner Real Madrid and reaching the semi-final stage. From the very beginning of the game Girona had control of the game dynamics both in possession and in transition moments even if initially they found it hard reaching dangerous zones consistently, due to Leganes keeping high numbers when defending in their own half and with strong defending in duels and challenge. It made it hard for Girona’s attackers to establish possession in the opposite half at first. However, their dominance became clearer after the ten-minute mark and they totally controlled the game restricting Leganes possibilities to starting dangerous offensive transitions which were reduced to long uncontrolled balls towards the forward easily defended by the back three of the home team. They achieved such dominance by gradually pushing Leganes into their own half through a not too complex but still effective attacking approach consisting of intensive and continual crosses into the box after creating a breakthrough using third man actions and long diagonal passes looking to exploit the forward runs from the wingbacks. The role of aggressive and quick counterpressing after the crosses should also be noted to fight for the second balls and the catching of rebounds, which combined with the lack of passing ability from Leganes’ defenders, reduced the Madrilenian team’s transitions to clearing out long balls which were then easily recovered by Girona’s central defenders. In these cases they simply circulate the ball safely between them until finding a passing option to the wingbacks to put crosses into the box immediately. The burst of balls into the box was aided especially by Stuani’s aerial ability which creates a huge threat for the opponents within the box. In fact, Girona’s box occupation is not especially striking in terms of number of player looking to head the first cross, usually two and no more than three most of the time. Moreover, they focused on a good occupation of rebounding zones and being close to the spaces where the ball was likely to be cleared to exert immediate and intense pressure on the ball, forcing Leganes to kick it long at worst and recovering the ball without too much trouble many times. Two or three players occupy the box attacking the cross. The near rebound zone is filled by the opposite winger and the midfielders. Far rebound zones and controlling the opponents’ striker(s) is up to the three centrebacks. Sometimes when one of the midfielders is supporting the crosser and/or there aren’t more than one opponent in far spaces, one of the centrebacks can step forward to add more pressure in the near zone . The opening goal came after a penalty from these successive crosses by the Catalonian team. Following the goal Leganes tried to react by pressing higher up the pitch and attempting more attacking presence in the opposite half. However they did not seem to have successful doing so but with early crosses and individual actions from Amrabat which lead to producing nothing other than naïve long range shots. Furthermore, and which is worse, this attempt to create more offensive functioning left the visitors defence exposed in defensive transitions which Girona exploits to score the second goal before the half time in a counterattack after an individual run from Portu through the right halfspace. The trend of the last fifteen minutes of the first half was maintained at the beginning of the second half even though visitors’ coach Asier Garitano made a clever move, entering Naranjo for Eraso and moving Amrabat to play a second striker role in an attempt to benefit from his dynamism and mobility across the front of the attack as well as his ability to create chances by himself. As such, Leganes kept trying to exert a higher pressing but since their defensive line did not push forwards to support the attackers it worsened their vertical compactness issues. Conversely, Girona gradually lowered their pressing and changed to a more passive defending of the second third of the pitch. Additionally, their offensive play become more oriented to direct play looking for Stuani, building their attacks from the second balls won in the opponent’s half and counterattacking more regularly. All of this was clearly related to the dynamics of the game and their shift in the defensive approach along with Leganes’ increasing attacking activity. Consequently, Girona’s step back allowed Leganes to carry their attacks more consistently into the opposite half and creating more chances through early crosses. Their offense was based mainly on direct passes looking for the constant movement of Amrabat in order to carry the ball into the box through individual actions aided by his press-resistance, and runs on the ball producing several long range shots and early crosses. Ultimately, Girona set the 3-0 with a late goal from Juanpe in a set-piece. Girona displays a 5-2-2-1 or 3-4-2-1 formation, which is notably uncommon in the Spanish League. Their attacking approach is based on a stable build-up quickly followed by vertical passing attempts mainly on the left sector. A common pattern consists on the left centreback – Juanpe – looking for Stuani’s dropping movements into the halfspace to directly lay-off to Mojica running through the wing in order to make a quick cross into the box or a second line pass directed to Borja in order to achieve more balanced follow-up in the construction moment. Stuani is very powerful and strong in the aerial duels which allows him to win many long seemingly difficult passes and laying off to Borja or Mojica. It is noticeable the differing roles of both attacking midfielders whose involvement during the attacks predominantly happens in the halfspaces. In the left side, Borja has a more playmaking role, coming deep if necessary to receive the ball between the lines. His passing skills and ability to receive under pressure allows him to control and create progressive passes after supporting in the halfspace. This is a very useful resource for Girona’s playing style and it is remarkable his ability to receive behind the opponent midfielder and completing accurate long diagonal passes towards the far wingback who runs forwards. During the build-up Girona performed a more possession-oriented approach in their own half. From a structure based on three centrebacks not excessively dispersed, both wingbacks coming deeper flexibly in order to attract the wingers of Leganes, and two midfielders giving support and passing lines with good timing and angles and playing almost always one touch passes and layoffs. Their overall tactical approach consisted of provoking Leganes’ pressing and forcing the four attackers and at least one midfielder to push forwards. In order to achieve this, they were keen to take risks and attempting short and quick passes between first and second lines combining diagonal and horizontal passing. Even though at first the opponents’ front players were reluctant of going high to press the ball – as noted below, the visitors’ plan seemed to be originally based on waiting until the ball enters into the second quarter of the pitch while guiding the centrebacks passes towards the wingbacks – they were easily manipulated and left their positions too early trying to win the ball back with no access nor cover from the players behind them. For the Catalonian team, their first aim with this tactic was to create spaces behind the midfielders in order to connect advantageous passes in the halfspaces with the attacking midfielders, especially focused on the left side with Borja making clever supporting movements, and alternatively playing third man actions by finding Stuani and then laying off to either Borja or directly to the wingback. In the scene above can be seen a clear example. After a supporting movement from Borja dragging the fullback out of position – as well as the midfielder – Stuani drops between the lines into the left halfspace giving a direct route for Juanpe to create a third man action and then laying off to accelerate the attack and looking for depth in a very quick manner. The movements between the lines from the attacking midfielders were defended at first by aggressive steps forward from Leganes fullbacks, if the midfielders were out of position, looking to force the ball backwards again. However, Borja made a solid use of his skillset receiving under pressure and still being able to find forward passes. For Girona this sort of build-up was key into translating the possession of the ball into dominance of the space in order to get into advanced positions. Even if the initial vertical was not successful, the dynamic and situation created dragging out of their block many Leganes players along with the compactness issues highlighted in the next section and a very aggressive and quick counterpressing made their challenges for the second balls an easy situation to win the ball back in the opponent half; or at worst to force Leganes to kick it long and then starting again from an higher position than originally. It’s also common during the attacks to attempt long diagonal passes from the left side – either Juanpe or Borja if he is able to receive the ball – looking for Aday, either running into the space to make a quick cross or, in case of not having a dynamical advantage, to challenge the aerial with Portu looking to catch the rebound and getting into the box running through the halfspace. Once into the opponent’s half, Girona doesn’t devote many efforts on creating complex combinations or long circulation. 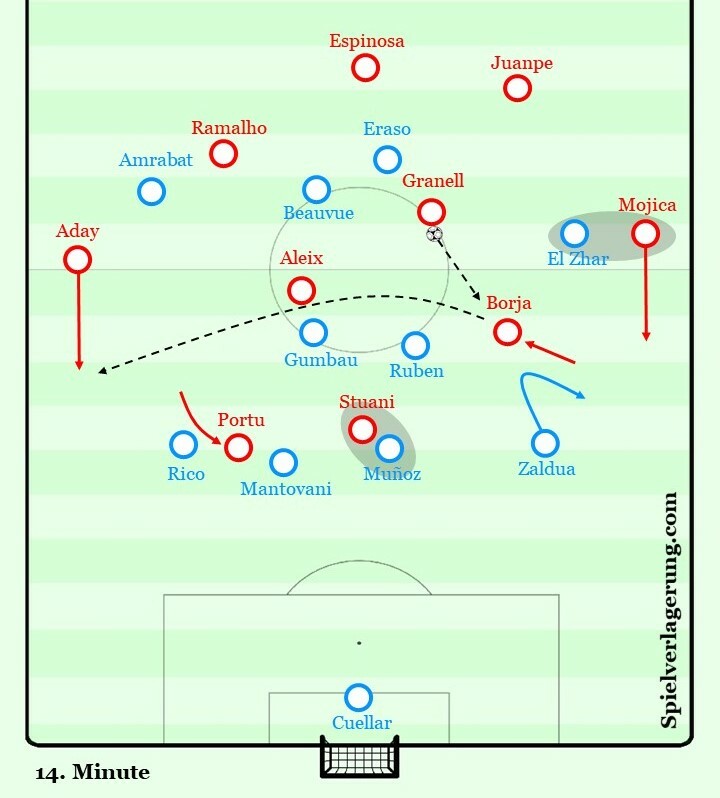 By contrast, if they cannot complete a quick penetrative attack playing to Stuani, or with the runs of either Portu through the halfspace or both wingbacks, the midfielders will then pass back to the central defenders already positioned in the halfway line to then moving the ball in order to find routes into the wings – either long diagonals or simply through dribbles from Mojica (15’) – as well as giving time to the attacker to reach good positions and getting ready for the cross and the subsequent rebounds. 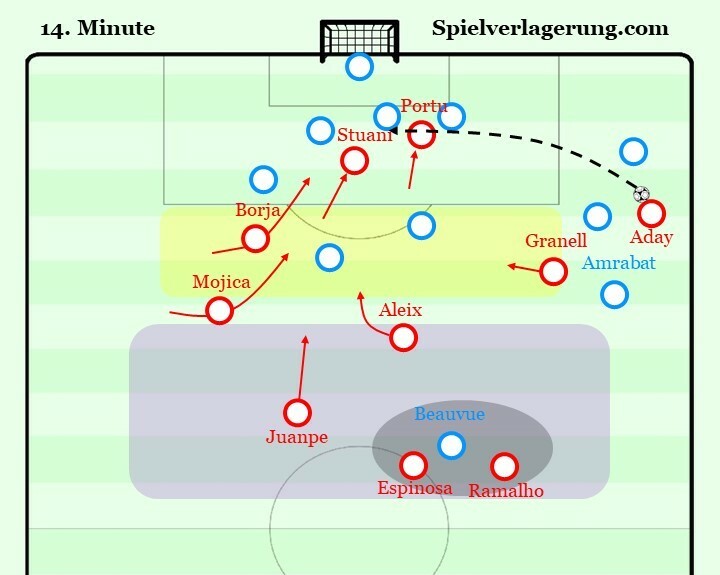 In the graphic above (by the exceptional @EuanDewar) can be observed the influence of Mojica’s dribbles related to the actions he makes after completing  them, mostly through the wing, and even if sometimes his decision-making is a little bit inconsistent the impact of colombian is noteworthy in the chance creation of Girona. For its part, Leganes displayed a medium pressing from a 4-4-2 man-oriented approach. They did not press the centrebacks from the first pass but trying to reduce the space guiding them towards the wings in order to pressure more intensely in these zones. Nonetheless they suffer several issues which didn’t allow them to get access and were manipulated by Girona’s circulation, leaving gaps between the lines which were targeted by the vertical passing and dropping movements of Borja and Stuani. Their lack of vertical compactness when pressing was due the back line not pushing as high as this was needed to support the pressing of the attackers. It forced the players who had gone on pressing running again backwards in order to close the spaces and defending without advantage the second balls. As a consequence, the team was inevitably forced back into their own box spending a lot of time defending deep and thus having their chances of counterattacking seriously restricted. 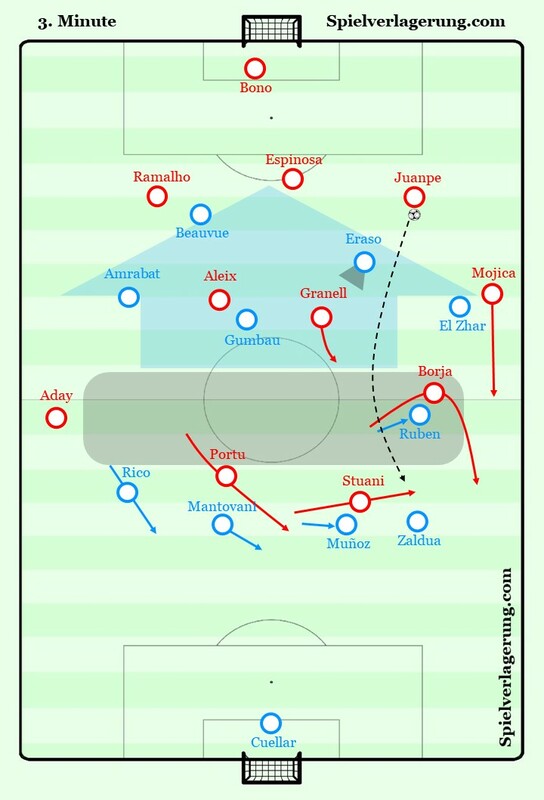 Furthermore, their lack of vertical compactness was worsened by the, at times, poor horizontal compactness, since Girona constantly moves into the midfield with either Borja in the halfspace or even Stuani with dropping movements, Leganes midfield was commonly overwhelmed by the numerical superiority. It should be highlighted the clever timing in the movements from Borja to attack the spaces behind the midfielders of Madrilenian team. Even when under pressure, he displayed great playmaking skills being able to connect vertical passes and especially accurate long changes of flank to Aday Benitez which were especially relevant to create chances through the wing. After conceding the first goal, Leganes tried to execute a higher pressing with the four attackers and at least one midfielder pushing forwards in the usual man-oriented basis but still they were not able to get access consistently given the numerical superiority in the first line of Girona and thus not creating enough pressure to force turnovers. 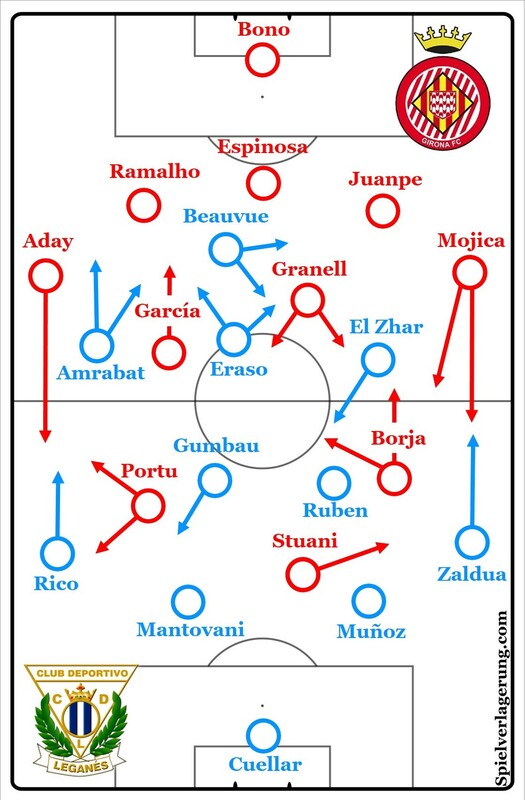 Also, given that Girona was able to create threatening situations by sending long balls towards Stuani given his aerial ability and enough presence in front to challenge the second balls with good movements in this regard from Portu, Borja and Aleix in the inside channels, it raised doubts on Leganes defenders about pushing forwards in order to fully support the pressing attempts from the attackers thus leaving even more space inside and eventually being forced again into their own half. The visitors, missing some key players due to injuries, displayed an asymmetric 4-2-3-1 on which the right sector was more significant during the – few – moments of build-up and construction of the attacks due to the presence of El Zhar in there. From the nominal winger position he moved flexibly across the inside channels, coming as deep as the #6 in order to connect the first and second lines of play from their own half with the players in front. It functionally creates a three man midfield and due to the presence of Zaldua in the right back it creates some potentially interesting numerical superiority and passing options. However, even if it was substantially better than the alternatives, it didn’t achieve enough fluidity in the circulation in order to be advantageous during the game. The lack of success during the circulation was mostly due to the poor connections and inconsistent structure where hardly were useful routes to move the ball from the back into advanced positions. Moreover it was complemented by a far from optimal decision-making on the ball from the players when building up. It is no surprising given the above that Leganes did not show too much interest in building from the back; at the smallest pressing attempt, the defenders cleared the ball, looking to win the second ball and eventually advancing and creating chances from such actions. Their main means in doing so were the individual solutions from Amrabat, whose runs mainly in the left side during the first half and across the front in the second, where targeted over and over. Unluckily for the Madrilenian team the output of these were mostly harmless early crosses – with a suboptimal box occupation also – and especially long range shots from odd locations. As can be observed the only attempts from inside the box by Leganes were on set-pieces [highlighted in orange colour]. Every attempt from open-play was from out the box. It shows the poor offensive plan and lack of tactical sophistication on the ball from Leganes, especially appalling Amrabat’s decision-making whose three shots combined didn’t add more than 0.03 xG [highlighted in red colour]. Data and visualization from understat.com. It is fair to acknowledge that the task of Amrabat was not easy at all since there was excessively large distances between him and the teammates attempting to support him effectively. Likewise, even accounting his disastrous decision-making on the ball, his work during both transition moments and his activity without the ball in order to be available for his teammates should be highlighted for sake of honesty. In this regard, it’s remarkable how the role of both centre midfielders is almost non-existent during all the attacking moments, they did not take part in the build-up nor in the opponent half attacks, their function essentially was limited to the defensive transition and to protecting the central spaces during their defensive phase as well as to man-mark the opposite midfielders during pressing. Finally, all the notes mentioned above – structure & decision-making – not only made it difficult for Leganes to carry out a proper attacking process but it also helped Girona to keep their own defensive stability while being able to press at times without being exposed at all since Leganes first passes did not disturb nor move out of position the Girona centre midfielders. On a side note, the lack of efficiency in direct play from Leganes can be attributed also to a couple of features from Girona; from one side the numerical superiority provided by three central defenders makes easier to defend the long balls, but they are also very strong defending these balls and starting attacks after winning possession. Early in the game there was a noteworthy scene which can be taken as paradigmatic of the common issues when trying to build-up and as such I want to use to explain more general notions about the complexity of positional play. On the first possession unit of the game, from the kick-off actually, Leganes showed early signs of wanting to play short passes from their half. However, after a few seconds the player on the ball quickly clears out the ball even though they were in clear numerical superiority. Girona simply needed 2-3 players attempting to press in the opposite half to force the long ball which was easily defended as they had five defenders and two midfielders to win the ball back in their half. The large distances between the left winger and the large distances to be covered by the midfielders in order get access to the second ball were also significant factors in the outcome of the action (i.e. Girona recovered the ball easily to start their attack). I do not want to go back into specifics of this game since are more or less clearly explained in the analysis, by contrast I want to look at some details of the situation itself. As can be observed, theoretically it is a situation of clear numerical superiority for the team in possession having as much as six players plus the goalkeeper against three players in distances to get involved in the pressing. However, that does not translate into positional superiorities – advantageous connections to progress across the pitch – and not even on allowing to keep the possession but also due to several issues related to the positioning and movements from the non-carriers as well as the risk-averse decision making from the carrier(s) involved in the sequence, it makes easier for the opponent players to create access forcing to clear the ball out. Focusing on the structural issues, the midfielders positioning is suboptimal from the start since both are positioned in the same line neglecting the creation of passing angles and limiting the potential continuity of the possession if they would have been connected. Furthermore, their movements during the sequence weren’t better either, both made movements towards the ball-carrier when the pass is played backwards even though this was not needed and since they had still room to open passing lines to enable progressive passing in first instance. Under an approach that tries to employ the ball-possession to create better conditions to carry out the attack, or in more easy words: positional play approach, solving these issues would imply a different movement and positioning (for matter of clarity as positioning in this context I mean the positioning before the sequence starts, there are some nuances about the starting points that are not going to be explained in detail in this piece). The most risk-oriented option would have been a separation movement by the left centremidfielder in the vertical axis. Its aim would have been to creating doubts on the opponent right winger about what to do. At least it would have made the decision-making process longer thus giving a small time gain to the ball carrier to pass the left centreback. If the winger had chosen to not step forward that pass would have been even clearer. If the winger would have pushed forward anyways, the midfielder would be in such position to receive in the subsequent actions most likely through combinations. In the worst case he would be positioned closer to the potential rebound or second ball if the central defender kicked long anyway. In short, with the separation movement he could have created a decisional-crisis on the opponent forcing him to make a decision and likely leaving opened at least one option. Another valid alternative for the left centremidfielder would have been the opposite, i.e. coming even deeper to position himself diagonally regarding the ball-carrier opening a direct pass option almost creating a back three chain. In this case, if the winger pushes to press he could still lay-off to the goalkeeper to make a long pass, passing to the left fullback, or simply clearing out. Furthermore, it is likely that either the right-winger wouldn’t push that high to press or if chosen to do so making with poor timing thus making possible for the left-centremidfielder to turn and give continuity to the circulation looking for progressive passing options. Any of the options above would have made more likely finding advantages during the build-up play. Consequently, it is a justifiable assumption to say that many times the search for stability and creating many connections in possession is not only achieved by creating a higher numerical overload in the ball sector. Conversely, it has more to do with the positioning of the players involved regarding the reference points and how they adjust their positioning during the dynamic in order to make easier the connections with a collective purpose rather than simply moving “to support the carrier” as individuals. It does not need to be inherently many passing options, but many times coordinating between several players in order to open one advantageous passing option is enough. This purposeful behaviour of the players needs to provoke such reactions from the opponents that no matter of what they do (e.g. step back or take risk going to press the ball) always is going to be at least one option available to give continuity to the circulation or advance. It should be acknowledged that the players from the right sector involved on the possession sequence took very risk-averse decisions both on the ball and without. The fullback stayed too passive after passing backwards neither moving deeper to support and combine with the near midfielder nor moving higher through the wing in order to drag the opponent. For his part, the centreback didn’t managed the timing of the pass staying on the ball a little bit longer to attract pressure neither passing back to the goalkeeper. A possibility to be accounted could be that the team approach was based on attracting pressure near to their own box to generate higher likelihood of winning the second ball after the long ball. Still, given that it clearly did not achieve the pursued effect the large distances made even more difficult to challenge the second ball. A valid solution would have been to play back to the goalkeeper and doing so giving time to the midfielders to move themselves higher in the pitch before the long kick by the goalkeeper. Moreover, another option that could be understood would be a risk-averse collective approach based on having certain positional stability in order to, under little pressure, build-up with safety and keep the possession with many players in their own half. However, at the end, it generates worse conditions for the most likely outcome in such situations: this is, to fight for the second balls after long balls since the team is functionally broken in two parts with too large distances between them. At the same time, the risk-aversion along with not being able to implement even the basic ideas of a short build up makes hard to have any success in the strategy. As a final thought; the game of football is about manipulating the opponents in order to get the best possible conditions in terms of space and time in order to execute the own actions directed to create chances regularly. This is true in any way through which a team want to address the attacking process. The only alternative is to trust that the opponent will make random individual mistakes that enable the conditions accidentally; things like a rebound, a wrong pass, etc. Hence, even if a team’s approach is partly based on random events, for example if they do not want to take certain risks and play long balls trying to win the second ball, it does not imply that an underlying tactical preparation is not needed to create better conditions for the actions to be made and reducing the randomness. In this example, to win the second ball the team will try to position their best player on aerial duels with the less powerful centreback, in order to do so they could try to manipulate the other centreback through certain actions like positioning the winger between the fullback and the centreback making supporting or depth movements. Another example mentioned above is provoking the opponent pressure trying to drag out of position as many players as possible from their back line in order to create longer distances between them before playing long. In any of these cases, the team needs to have a set of tactical principles and ways of creating the aforementioned conditions. Furthermore, there is a strategic dimension to be accounted, given that the fundamental intention is to manipulate and thus deceive the opponent the team needs to predict and be ready for the opponent’s reactions either adjusting across the game or not falling in the principal manipulative tactic. In the first case, the winger in order to manipulate need to be at least perceived as a real threat for the opponents, and to do so it has to be a potential threat across the game and the team needs to know how to use that option to be a real threat. The ideal playing style would be able to force the opponent to adjust to our first manipulative tactics because our playing style would create another threat even more dangerous in case of not adjusting to the first one. For example, if a team is forced to press the build-up because otherwise the team would push them back into their own box through a purposeful possession neglecting any chance of transitioning to the attack.